1. Obituary: 13 March 2004 Anna Beatrice Sammons of Dover died Wednesday March 10, 2004 in Kent General Hospital after a long illness. She was 78. Mrs. Sammons was born January 16, 1926 in Cheswold Delaware to the late Franklin Johnson and Mary Carney Johnson. She worked for Wheatley's Canning Company, at the Modern Maturity Center in Dover as a kitchen helper and also for Capitol School District in food service. Mrs. Sammons was very active in her church the Immanuel Union United Methodist Church in Cheswold. She was the church historian and Communion Stewart and President of the Women's Society and lay reader for the church. She was part of the Lenape Native American Tribe. She was an avid card player, pianist and crocheting. She was preceded in death by her first husband Floyd "Perk" Ridgway May 25, 1986, a son, Ronald Johnson in 1988, and a son in law Warren Pritchett, Jr. November 20, 2002. Mrs. Sammons is survived by her husband of 10 years Luther Sammons; 3 sons, Floyd Ridgway II of Dover, Lee Ridgway, Mike Ridgway both of Cheswold; one daughter, Shirley Pritchett of Dover; 3 brothers, Jackie Johnson, James Johnson both of Cheswold, Linwood "Woody" Johnson of Dover; 5 sisters, Mary Virginia Morgan, Dorothy Coker, Sandra Coker all of Dover, Winona Wortham of Milton, Joan Brittingham of Dover; 10 grandchildren; 9 great grandchildren and one on the way; 5 step children. Wanda Seeney, Shelia Pierce, Brenda Sammons, Luther Sammons all of Dover, James Sammons of Cheswold; 11 step grandchildren and 9 step great grandchildren and 2 special caregivers, Shelia Pierce and a niece Wanda Mosley and a host of nieces and nephews. 2. Obituary: 18 Mar 2004 Services for Anna Beatrice Sammons, 78, of Dover were held Monday, March 15, at Immanuel Union UMC, Cheswold. Mrs. Sammons died after a long illness Wednesday, March 10, 2004, at Bayhealth-Kent General Hospital, Dover. Mrs. Sammons was born Jan. 16, 1926, in Cheswold, daughter of the late Franklin and Mary Carney Johnson. She worked for Wheatley's Canning Co., at the Modern Maturity Center in Dover as a kitchen helper and for Capital School District in food service. She was part of the Lenape Native American Tribe. She was an avid card player, pianist and crocheter. Mrs. Sammons was very active in her church, the Immanuel Union United Methodist Church in Cheswold. She was the church historian and Communion steward and president of the Women's Society and a lay reader for the church. She was preceded in death by her first husband, Floyd "Perk" Ridgway, May 25, 1986; a son, Ronald Johnson, Sept. 18, 1988; and a son-in-law, Warren Pritchett Jr., Nov. 20, 2002. She is survived by her husband of 11 years, Luther Sammons; three sons, Floyd Ridgway II of Dover and Lee and Mike Ridgway, both of Cheswold; a daughter, Shirley Pritchett of Dover; three brothers, Jackie and James Johnson, both of Cheswold, and Lenwood "Woody" Johnson of Dover; and five sisters, Mary Virginia Morgan, Dorothy Coker and Sandra Coker, all of Dover, Winona Wortham of Milton and Joan Brittingham of Dover. She also is survived by 10 grandchildren; nine great-grandchildren and one on the way; five stepchildren, Wanda Seeney, Shelia Pierce, who was one of her special caregivers, Brenda Sammons and Luther Sammons, all of Dover, and James Sammons of Cheswold; 11 step-grandchildren; nine step-great-grandchildren; another special caregiver, her niece, Wanda Mosley; and a host of other nieces and nephews. Arrangements were by Torbert Funeral Chapel, Dover. Burial was in Immanuel Union United Methodist Church Cemetery. Letters of condolence may be made at www.delmarvaobits.com. 3. Obituary: 13 Mar 2004 Anna Sammons of Dover died Wednesday, March 10, 2004, in Bayhealth-Kent General Hospital, Dover, after a long illness. She was 78. Mrs. Sammons was born Jan. 16, 1926, in Cheswold, daughter of the late Franklin Johnson and Mary Carney Johnson. She worked for Wheatley's Canning Co., at the Modern Maturity Center in Dover as a kitchen helper and also for Capital School District in food service. She was part of the Lenape Native American Tribe. She was an avid card player, pianist and crocheter. Mrs. Sammons was very active in her church, the Immanuel Union United Methodist Church in Cheswold. She was the church historian and Communion steward and president of the Women's Society and lay reader for the church. She was preceded in death by her first husband, Floyd "Perk" Ridgway, May 25, 1986; a son, Ronald Johnson, Sept. 18, 1988; and a son-in-law, Warren Pritchett Jr., Nov. 20, 2002. She is survived by her husband of 10 years, Luther Sammons; three sons, Floyd Ridgway II of Dover and Lee Ridgway and Mike Ridgway, both of Cheswold; a daughter, Shirley Pritchett of Dover; three brothers, Jackie Johnson and James Johnson, both of Cheswold, and Lenwood "Woody" Johnson of Dover; five sisters, Mary Virginia Morgan, Dorothy Coker and Sandra Coker, all of Dover, Winona Wortham of Milton and Joan Brittingham of Dover; 10 grandchildren; nine great-grandchildren and one on the way; five stepchildren, Wanda Seeney, Shelia Pierce, who was one of her special caregivers, Brenda Sammons and Luther Sammons, all of Dover, and James Sammons of Cheswold; 11 step-grandchildren; nine step-great-grandchildren; another special caregiver, niece Wanda Mosley; and a host of other nieces and nephews. Armwell "Cookie" Sammons III, 77, of Mantua, passed away Thursday, at Presbyterian Hospital. Born in Bridgeton, he lived in Mantua for over 49 years. "Cookie" was a retired foreman from Eastern Knitting Mills Co., in Bleinheim, served in the US Navy from 1943-1945, and was an ORIGINAL lifetime member of the Raccoon Boat Club in Bridgeport. He enjoyed his family and traveling and will be deeply missed by all who knew him. He is survived by his wife Madeline (nee Sharp), son Terry and wife Joanne, brother Gordon L. of Sparta Tenn., grandsons Shane and Chris, several nieces and nephews and 3 sisters-in-law. Viewing will be on Monday from 6-8 p.m. at LANDOLFI FUNERAL HOME, 300 W Broad St., Paulsboro, Service will be at 8 p.m. at the funeral home. Burial will be private. In lieu of flowers donations may be sent to the Charity of your choice. Arthur Sammons, 69, died Friday, Jan. 10, 1964 in Kent General Hospital. He was a resident of the Dover area. Funeral services will be held Wednesday afternoon, Jan. 16, at Immanuel Methodist Church, Cheswold. Interment will be in Fork Branch Cemetery. He is survived by three daughters, Mrs. Margaret Hands, Mrs. Edith Ridgeway, both of Bridgeton, N. J., and Mrs. Helen Johnson of Dover; two sons, Luther Sammons, Dover, and Arthur Sammons, Jr., Bridgeton; one sister, Mrs. Pearl Burton, New Brunswick, NJ. Arthur A. Sammons, Jr., 64 of Fairfield Twp. died early Sunday morning Feb. 10, 1985 at the residence after having been stricken with a heart attack. Mr. Sammons had been in failing health the past three months. Born in Delaware, he was the son of the late Arthur A. Sr. and Beulah Ridgeway Sammons and the husband of Mary L. Dean Sammons. The couple had celebrated their 25th wedding anniversary this past December. Mr. Sammons had been employed as a carpenter and was a member of Local #121 of the Carpenter's Union, retiring in 1964 due to ill health. He was a member of several CB clubs throughout the area. Surviving in addition to his wife are a stepdaughter, Helen Dean of Greenwich; a brother, Luther Sammons of Delaware; three sisters, Beatrice Hands and Edith Ridgeway, booth of Bridgeton, and Helen Johnson of Cheswold, De; and several aunts, uncles, nieces and nephews. Services will be conducted by the Rev. Thomas W. Morgan, pastor of First Church of the Nazarene, on Wednesday at 1 p.m. from the Sray Funeral Home, Carlls Corner. Interment will be de in Fernwood Memorial Park Friends will be received Tuesday evening from 7 to 9 at the funeral home. The family request the flowers be omitted. Benjamin Simons, well-known in Wayne for many years as proprietor of a livery stable, passed away Thursday morning at the Peoples Community Hospital at Eloise. Services in charge of Rev. Roy Lee Sheehy, pastor of the Church of the Nazarene, will be held at the Uht Funeral Chapel on Saturday, Apr. 14, at 1:00 P.M., and burial will be in Glenwood Cemetery. Ben A. Simons, age 73, 220 Midway St., Dundee died at his residence, Wednesday, March 21, 1979 at 7:00 p.m. He had been in ill health for 6 years. Services were held Saturday at 1:00 p.m. at the Buhl Funeral Home with the Rev. Florence M. Hedwell of the Dundee Presbyterian Church and Rev. Elwin L. Freeland of Church of Christ, Southgate officiating. Burial was in Maple Grove Cemetery, Dundee. Bearers were Paul Sheldon, Jon Eckert, Gerald Newman, Jim Cullip, Orville Rowe and Dale Metty. Honorary Bearers were Fred Kurtz, Erwin Salisbury, Harry Lockwood and Hubert Thompson. Born October 2, 1905 in Wayne, Michigan, he was the son of Benjamin and Lillian (Norwood) Simons. He had resided in the area for 46 years, coming to Dundee from Detroit. He was married to Lucy C. Cahoon in Toledo, Ohio on July 30, 1926. He was a member of the Dundee United Presbyterian Church. Mr. Simons was graduated from Wayne High School in 1923, graduated from Detroit Institute of Technology with Bachelor's Degree and from the Detroit College of Law in 1933. He established a law office in Dundee from 1933 to 1937 when he started his office in Milan. He was a member of the Monroe County Bar Association. In the late 1920's and early 30's he served as liquidator for several banks that were closing. He served as Village Attorney for Milan several years when Milan was a village and also as Attorney for Dundee for several years. In 1970, he was named to the City of Milan areas school Board of Education as representative to the Planning Commission. He was also a consultant for the School Board's Financial Management. Mr. Simons was active in real estate and owned several pieces of property in Milan and Dundee areas. He was a partial owner of Raisin Valley Title Co. from 1962 until last April. He was also part owner of Schafer's restaurant in Monroe, Toledo and Ann Arbor. He served for several years on the Board of the Mercy-Memorial Hospitals in Monroe. He is survived by his wife, Lucy. Ben A. Simons, 73, a practicing attorney in the Milan-Dundee areas for more than 45 years, died in his home, 220 Midway St., Dundee, Wednesday night. He had been ill about six years. A native of Wayne, he was born Oct. 2, 1905, the son of Benjamin and Lillian Simons. After graduating from Wayne High School in 1923, Mr. Simons entered the Detroit Institute of Technology, from where he received his bachelor's degree. On July 30, 1926, Mr. Simons married the former Lucy C. Cahoon in Toledo. She survives him. In 1933. he received the juris doctorate Detroit College of Law. That same year he set up his law offices in Dundee. According to Milan real estate agent Louie Newman, a close friend of Mr. Simons, during the Depression years (late 1920's, early 30's) Mr. Simons was a liquidator of banks that were closing because of the times. In 1937, Mr. Simons moved his law offices to their present location, 108 E. Main St. in Milan. He served for numerous years, Mr. Newman said, as village attorney for Milan (when it was a village) and, during the same period, for the Village of Dundee. Mr. Simons was named in 1970 to serve on the city's planning commission as the Milan Area Schools Board of Education representative. Mr. Newman also said that he was the consultant for the school board's financial managements. Quite active in real estate, Mr. Simons owned several pieces of property and several stores in the Milan and Dundee areas. He was a partial owner of the Raisin Valley Title Co. in Monroe from 1962 until last April. In addition, he and three other county men owned the Schafer's restaurants, which include Monroe's at 15415 S. Dixie Hwy. and one in Toledo and Ann Arbor. A member of the First United Presbyterian Church in Dundee, Mr. Simons was also on the Mercy-Memorial Hospital Board for many years. He was also a member of the Monroe County Bar Association. Friends may call after 7 tonight in the Buhl Funeral Home, Dundee, where funeral services will be at 1 p.m. Saturday. The Rev. Florence M. Hedwall of the First United Presbyterian Church and the Rev. Elwin L. Freeland of the Southgate Church of Christ will officiate. Burial will be in Maple Grove Cemetery. The family requests memorials be made to the Michigan Cancer Foundation. Dundee - Bearers for Ben A. Simons, 73, of 220 Midway St., who died Wednesday in his home, were Paul Sheldon, Jon Eckert, Gerald Newman, Orville Rowe, James Cullip and Dale Metty. Honorary Bearers were Harry Lockwood, Fred Kurtz, Hubert Thompson and Erwin Salisbury. Bertha C. Sammons, 58, of Dover, died Wednesday in Kent General Hospital, Dover, Del. Surviving are her husband, Luther; her father, Alfred Morris of Dover, Del. ; three daughters, Wanda Seeney and Brenda Sammons, both of Dover, Del. and Sheila Pierce of Fairton; two sons, Luther A. Sammons and James A. Sammons, both of Dover, Del. ; five brothers, George Morris and Allen Morris, both of Bridgeton, Thomas Morris of Dover, Del, Carlos Morris of Cheswold, Del. and Wendell Morris of Westport, Mass. ; and three sisters, Gertrude Mosley of Philadelphia, Barbara Pierce of Bridgeton and Gladys Burrell of Dover Del. Services will be held at 2 pm Sunday from Immanuel United Methodist Church, Cheswold, Del. Interment Fork Branch Del. Friends will be church Saturday p.m. Funeral under the Stevenson Dover Del. will be made in Cemetery, Dover, received at the from 7 to 9 arrangements are direction of the Stevenson Funeral Home, Dover, Del. Charlie Chaplin "Little Charlie" Sammons, 66, of Millsboro, passed away Thursday, May 14, 2009, at the Delaware Hospice Center in Milford. Charles was a member of the Nanticoke Indian Association in Millsboro and attended Indian Mission United Methodist Church. He is preceded in death by his parents, Oscar and Virginia Street Sammons. His caregiver, Kathleen Bradley of Millsboro; a stepson, Elwood Hitchens of Millsboro; and a brother, Lawrence Sammons of Millsboro, survive him. A funeral service will be held at 11 a.m., Wednesday, May 20, at the Indian Mission United Methodist Church, Millsboro, where friends may call at 10 a.m. Interment will follow in the church cemetery. Charles E. Sammons, of near Dover, died Thursday, Nov. 1, 1984, in Kent General Hospital, Dover, of a heart attack. He was 61. Mr. Sammons was employed by Wade insulation Company of Dover. He was a veteran of World War II. He is survived by his wife, Esther Glendora Sammons; six sons, Charles H. Sammons Jr., Edward Sammons, and Glendon Sammons, all of Cheswold, Robert Sammons, Marydel, Phillip Sammons, Millsboro, and John Hughes, Glen Burnie, Md. ; three daughters, Linda Horan, Dover, Sherylene Miller and Marilyn Durham, both of Bridgeton, N.J.; his mother, Lettie Sammons, Bridgeton, N.J.; his stepmother, Grace Sammons, Cheswold; four brothers, Herbert Carey, Denver, Colo., Robert Carey, Cleveland, Ohio, John and Vernon Sammons, both of Bridgeton, N.J.; four sisters, Thelma Pierce, Grace Jones and Dorothy Pierce, all of Bridgeton, N.J., and Eva Mosely, Dover; and 15 grandchildren. Services will be 2 p.m. Monday at the Torbert Funeral Chapel, Bradford and Reed Streets, Dover, where friends may call one hour earlier. Burial will be In Immanuel Church Cemetery, Cheswold. Charlotte G. (nee Griggs) Sammons of Clarksboro formerly of Gibbstown. On Apr. 20, 2001, age 88 yrs. Wife of the late Elmer (Slim) Sammons. Survived by 2 daughters-Edna E. Askew ofLindenwold, Betty J. Swift of Clarksboro, 15 grandchildren, 24 great grandchildren, and 2 great-great grandchildren. Relatives and friends may call Tuesday from 10am to 11am at the SMITH FUNERAL HOME, 47 Main St., Mantua. Funeral Service will be Tuesday 11am at the funeral home. Burial will be in the Eglington Cemetery.Contributions may be made to St. John of God Community Services, 532 Delsea Dr.,Westville Grove, NJ 08093 or the charity of donor's choice. Delores E. Sammons of Dover passed away Thursday, Nov. 29, 2007, at home, with her family by her side. She was 82. Mrs. Sammons was born Jan. 9, 1925, in Battle Creek, Mich., daughter of the late Orville Seeney and Bernice Fruin. She moved to Washington, D.C., as a young child and later moved to Delaware. Mrs. Sammons was employed for many years as a teacher's aide for the orthopedic department at William Henry Middle School, Dover. She retired in 1990. She was a longtime member of Forest Grove Seventh Day Adventist Church, Dover, where she was active with many committees, served as an organist/pianist, secretary, clerk and teacher, and was a member of the ladies club. Mrs. Sammons enjoyed gospel and country music, reading, crosswords, arts and crafts, shopping and going to lunch with her friends. She was well known as an excellent seamstress. Mrs. Sammons was a member of the Red Hat Society and enjoyed cooking, canning, crocheting and bird watching. She also greatly enjoyed spending winters with her husband in Avon Park, Fla., for 18 years. Her husband and family were the most important things in her life, and she will be remembered as a person who loved life to the fullest and as one who lived by the golden rule. Through her daily devotions, Mrs. Sammons was preparing for the Lord to come. She was preceded in death by a brother, Dalton Seeney; two grandsons, Jonathan Sammons and Hoss Sammons; and a great-grandson, Matty Wade Sammons. She is survived by her husband of 65 years, Ulysses G. Sammons; two sons and daughters-in-law, Ulysses E. and Carol Sammons and Orville A. and Sue Sammons, all of Dover; five daughters and sons-in-law, Sharron L. and Austin Carney of Dover, Vanessa G. and Peter Roe of Ormond Beach, Fla., Kathy R. and William Usilton of Berrien Springs, Mich., Alverta J. and Alaric Johnson of Topsham, Maine, and Tammy D. and Larry Prelog of Niles, Mich.; 23 grandchildren; 20 great-grandchildren; three great-great-grandchildren; and a host of nieces and nephews. Mrs. Sammons encouraged her special granddaughter, Stephanie Carney, through the trials of her disability. In addition, she is survived by her best friends, Alverta and Dan Durham and Lorraine Coker; her special cousin, Juanita and her husband Lawrence Freeman; and a host of many other friends. The family wishes to thank her granddaughters, Wendi Schrock and Stacy Johnson, who cared for her, as well as Susie Nickerson, who also provided care to her during her illness. Lastly, the family wishes to thank her special nurse, Paulette, and all of the nurses and staff of Delaware Hospice. Friends may call from 7 to 9 p.m. Monday at Matthews-Bryson Funeral Home, 123 W. Commerce St., Smyrna. Services will be noon Tuesday at Forest Grove Seventh Day Adventist Church, 4950 Pearsons Corner Road, Dover. Burial will be in Forest Grove Church Cemetery. While flowers are welcome, contributions may be sent to Delaware Hospice Inc., 911 S. DuPont Highway, Dover, DE 19901. Dorothy Sammons, of Bridgeton, died Tuesday, Feb. 5, 2008, in Thomas Jefferson University Hospital, Philadelphia. Her death was sudden and unexpected. She was 80. Born in Cheswold, Del., she was the daughter of the late Oscar P. and Letisha "Lettie" Sammons. She was a resident of Bridgeton for many years and had previously lived in Millville, N.J. Dorothy had worked for many years in nursing with the former Bridgeton Hospital and Bridgeton Nursing Center. She also previously worked at Cumberland Manor. Dorothy enjoyed crocheting and sewing and attended the Fairfield Adult Day Care Center. She also was a member of the Nanticoke Lenni Lenape Indians of Bridgeton. In addition to her mother and father, she was preceded in death by six brothers, John Sammons, Vernon Sammons, Alfred Sammons, Charles Sammons, Alfred Pierce, and Oscar Sammons Jr.; and two sisters, Grace Jones and Rebecca Sammons. Surviving her to cherish her memory is her one daughter, Letisha E. Streets Mosley of Millville; her four sons, McClaren A. Streets of Bridgeton, William A. Streets of Vineland, N.J., Angel Davila and Juan Rosado, both of Virginia, two sisters, Eva Mosley of Dover, Del., and Thelma Pierce of Bridgeton; five grandchildren, Heather Streets, Brandon Streets, Juan Rosado III, Thomas Miller, and Stephanie Miller. Funeral services will be noon Monday in the , 62 Landis Ave. at Carll's Corner, Upper Deerfield Township, N.J., where friends may call one hour prior. The interment will be in Fordville Memorial Park, Fairfield Township, N.J.
1. Obituary: Edward M. Sammons, 60, of Pennsauken died Friday in West Jersey Hospital in Camden. He was born and raised in Bridgeton. He was educated in the Bridgeton schools. He served in the U.S. Air Force in Knoxville, Tenn. He was employed at Our Lady of Lourdes Hospital in Camden for 14 years and currently was employed at Carl Miller Funeral Home in Camden. He had worked at the funeral home for 25 years. He is survived by his wife, Janet; six sons, Norman of Scenic City, Ala., Jonathan of Bridgeton, Eric of Vineland, Antwine of Camden and Richard and Edward Jr. of Pennsauken; two daughters, Linda Olivarez of Bastbop, Tex., and Rachel of Camden; two stepchildren, Theresa and Craig of Camden; nine grandchildren; his mother, Mable Carney of Bridgeton; a brother, Jack of Willingboro; and two sisters, Agnes Green and Dorothy Tudos of Bridgeton. Funeral services will be held 11 a.m. Thursday at the Carl Miller Funeral Home, 831 Van Hook St., Camden. A viewing will be held Thursday, 9 to 11 a.m. Interment will be in Sunset Memorial Park, Pennsauken. 2. Death Notice: SAMMONS — Of Pennsauken, N.J., in West Jersey Hospital, Camden, N.J., on Friday, Nov. 11, 1994. Edward M. Sammons, aged 60 years. Relatives and friends are invited to attend funeral services Thursday, Nov. 17 at 11 a.m. from the Carl Miller Funeral Home, 831 Van Hook St., Camden where friends may call after 9 a.m. Interment at Sunset Memorial, Park, Pennsauken. Funeral services under the direction of Carl Miller Funeral Home. Elizabeth B. Sammons, age 82, departed this life Sunday, April 8, 2012, in Tampa, Florida, where she maintained residency since 2008 when she relocated with her eldest daughter. She was born July 7, 1929 and reared in Valdosta, Georgia until marrying Homer Sammons, Jr., who was in the United States Air Force. After living with her spouse in various places, including England and Greece, she resided in Wilmington, Delaware where they lived for 40 years with their family. She was active in church and was a member at United Missionary Baptist Church in Wilmington, DE and continued to attend with Pastor Watson when it became Wings of Faith. She attended Allen Temple in Tampa, Florida. She was a devoted Christian wife and mother. Her spouse preceded her in death in 1998. She had nine children and four have preceded her in death. She is survived by five children, Beverly, Bernard, Linda, Homer, 3rd, and Phyllis as well as three siblings, Marian, Evelyn and Carl. In addition, she is survived by twelve grandchildren, nine great grandchildren, many cousins, nieces, nephews and other relatives. She was kind and gentle and will be deeply missed, but will remain lovingly embedded in memories. Funeral Services 10:30 am on Friday, April 20, at St. Paul UAME Church, 3114 N. Market Street, Wilmington, DE 19802, with viewing 9:00-10:15 am only followed by burial 1 pm at Delaware Veterans Memorial Cemetery. Mrs. Elizabeth Gould Sammons passed away peacefully early Sunday morning, April 19, 2009 at her home surrounded by her family. She was born May 18, 1911 in Philadelphia, PA to the late Harry Gould and Estelle Gould. She attended public schools in Philadelphia and Maryland. She married Homer Sammons on December 22, 1931. From this union of marriage came five children; Homer Sammons, Jr. (deceased) , Gilbert Sammons (deceased) Jacqueline Smith, Owen L. Sammons and Bernard Sammons. She was a member of St. Joseph Church, French Street, Wilmington, DE for approximately 40 years. Other memberships included: a 25 year member of the Daughters of Isabel(under the church affiliation, former prefect of the Virgin Mary Society) and a charter member of Moss-Robertson, a VFW Auxiliary. Both parents died during her early childhood and she was raised by her paternal grandparents, Charles and Carrie Gould. Elizabeth Gould Sammons leaves to cherish her memory, three children; Jacqueline Smith (husband-Booker Smith), Owens L. Sammons (wife-Willette Sammons) and Bernard Sammons; two daughters-in-law, Elizabeth (Libby) Sammons and Jeanette Sammons. She also leaves to cherish her memory four generations of grandchildren, great grandchildren and great-great grandchildren. While raising her family she was a devout Catholic, a hardworking, loving mother and a supportive wife. Elizabeth's failing health slowly took its toll; however, it did not keep her from her love of life. She enjoyed traveling, reading, family gatherings and she made every effort to attend church and special family events. She loved spending time with family making memories. Felicia Virginia Sammons of Millsboro died of kidney failure Saturday, March 23, 1996, in Beebe Medical Center, Lewes. She was 79. Mrs. Sammons was born in Lewes, the daughter of Elmer and Mary F Street. She was a domestic worker in the Lewes and Rehoboth area until she retired in 1986. She was a member of the Nanticoke Indian Association Indian Mission United Methodist Church and Nanticoke Elder Center, Millsboro. She is preceded in death by her husband, Oscar B. Sammons, in 1962. She was survived by two sons, Lawrence E. Sammons, and Charlie C. Sammons, both of Millsboro; 18 brothers, Escuss Street of Milford, Harold Street of Mississippi, Richard Street, Curtis Street and William Daisey, all of Dover, Weldon Street of Seattle, Everett Street, Paul Street and Charles Street, all of Lewes, Robert Street and Newlin Street, both of Wilmington, Roy Street of Harbeson, Nolan Street and Garciel Street, both of Millsboro, Nathan Street of California, Ronald Street of Selbyville, and Victor Street and Carl Street, both of Ellendale; five sisters, Margaret Harris of Wilmington, Pearl Barks of California, Ruth Street of Texas, and Merle Street and Marion Street, both of Ellendale. Service will be 2 p.m. Saturday in Indian Mission United Methodist Church, Del. 5 and Sussex 48, east of Millsboro, where friends may call one hour before the service. The Rev. Palmer S Clark will officiate. Burial will be in Indian Mission Church Cemetery. Arrangements are by Watson Funeral Home, 211 Washington St., Millsboro. Gail Evon Sammons age 41 passed away suddenly Jan. 5, 2002 in Wilmington Hospital. Beloved daughter of Elizabeth Sammons & the late Homer Sammons. Loving sister of William, Bernard, Linda, Homer III, & Phillis Sammons & Beverly Hopkins. Miss Sammons had been a teacher at the McKean High School & was a member of Alpha Baptist Church. Funeral service 11 am Fri., Jan. 11 at Alpha Baptist Church, 205 Thames St., Belvedere. Viewing 9-11. Interment in Gracelawn Memorial Park. Arrangements by CONGO F.H. Isaac Sammons of Commerce Street, died Monday, April 21, 1980 in the Delaware State Hospital south of Wilmington after suffering an apparent heart attack. He was 67. Mr. Sammons was employed by George and Lynch Inc. of Dover as a construction worker. He is survived by two daughters, Winifred Ridgeway, and Evelyn C. Johnson of Cheswold; 14 grandchildren and 11 great-grandchildren. He was divorced. Funeral services Saturday at First Baptist Church of Cheswold. Burial will be in Immanuel Union Cemetery, Cheswold. From a local paper near the City of Wayne, Wayne Co., MI (probably the Wayne Dispatch). James Simons, Wayne pioneer, born February 14, 1829, passed away at his home on Dewey avenue, March 16, 1924, following an attack of paralysis of three days duration. He was buried on March 19th, Rev. Phelps officiating, with interment in Glenwood Cemetery. Mr. Simons spent his boyhood days in Pennsylvania where, on April 11, 1852, he married Susan Grimace, and later moved to Michigan. He settled on a farm four miles northeast of Wayne, near what is now known as the Birch Hill Country Club. In 1866, his wife died, leaving beside her husband, a family of small children. Mr. Simons helped to build the first road in Wayne, and also served in the Civil War. He leaves to mourn his loss, three children, Miss Prudy and Ben Simons of Wayne and Mrs. Margaret Norwood of Cherry Hill, besides a great many friends. He was ill only three days, being stricken with paralysis on Friday. James Arthur “Jimmy” Sammons went into the arms of his heavenly father on Saturday, November 24, 2012 at the age of 46. He was the son of Luther Sammons and the late Bertha Caroline Sammons. He was preceded in death by his beloved grandson John V. Ryder Jr. “Johnny Blue”. James went to heaven and left behind his soul mate and wife of 26 years, Lori L. Sammons. Jimmy is also survived by his four loving daughters, the keys to his heart and son-in-laws; Nicole “Nikki” and Dantae Ramirez, Rebecca “Becky” Naylor and Ervin Hardy, Jacquelynn “Jackie” Naylor and Roger Drinks, Victoria “Vikky” Sammons and Sergio Wilkerson; and a very special son, John V. Ryder Sr. James also leaves behind his grandbabies, the joys of his life; Cameron, Micah, Darrius, Nevaeh, Marcus, Rafael, Alyssa, Gabriel, Devon, Olivia, Ervin and R. Jay. Lost without their baby brother are his brother and sisters and their spouses; Luther A. and Anita Sammons, Wanda and Anthony Seeney, Shelia and Herbert Pierce, and Brenda Sammons. He also leaves behind his goddaughter, Ashley Pierce and a host of nieces, nephews, aunts, uncles, cousins and friends too numerous to name. He will be missed by his nearly 5,000 friends on Facebook where he posted almost daily, “words of inspiration” until he became too ill to do so. 2. Jason W. Sammons Sr., of Cheswold, passed away Saturday, Feb. 16, 2008, in the Delaware Hospital for the Chronically Ill, Smyrna. He was 39. Born May 18, 1968, he was the son of Charles S. and Dorothy L. Sammons. Jason received his education at the Capital School District, Dover. His love for life was his family, friends and working side by side with two of his close friends of many years, Joe Dugan Sr. and Joe Dugan Jr., to which he worked at Joe Dugan Racing Stables, Dover. Jason was an avid fan of harness racing and any other sport he could involve himself in. He attended Dover Downs and Harrington Raceway on a regular basis until his illness over come him. He then would watch it every Sunday on Post Time, and was sure to keep up with the latest and greatest. He coached Little League in Dover for two of his sons' teams taking them to the championship. Jason enjoyed watching football, his favorite team was the Indianapolis Colts, and he loved Payton Manning. He was preceded in death by his great-grandmother, Esther Hughes; and two grandfathers, Linwood Mosley Sr. and Charles E. Sammons. He is survived by his parents, Charles and Dorothy Sammons of Cambridge, Md. ; his three sons whom he adored, Rubon D'Jaun May and his wife Syreeta and Jason W. Sammons Jr., all of Dover, and Jay Wayne Ryan-Sammons of Annapolis, Md. ; one grandson, Trevon Wooten of Dover; one granddaughter, Saniyah May; two sisters, Stephanie L. McCoy and her husband Victor of Felton and Kimberly Ortiz and her husband Nelson of Lincoln; his godparents, Mary Stafford of Millington, Md., and Edward Sammons of Dover; three god-sisters, Jill, Serena and Sherry; one god-brother, Floyd; his grandmothers, Glendora Sammons and Emma Seeney; a favorite uncle, Zahn Hughes, whom he dearly loved; an aunt that meant the world, Joyce Sammons; two nieces, Courtney McCoy and her fiance Zachary and their son Hunter of Felton, and Shannah Ortiz of Lincoln; four nephews, Justin and Dylan Sammons, both of Lincoln, Zachary Ortiz of Lincoln and Garrett McCoy of Felton; those spoke of often and were close to his heart, Joey, Shelton Powell, Darren May, Tony Lewes, Tilicia May and too many more friends to name, but they know who they are; his first granddaughter that is due on his birthday, whom he was proud to talk about; a host of aunts, uncles and cousins who loved him dearly; and Reuben and Dorothy May of Dover, who were like second parents to him and he spoke of them frequently. Funeral services will be 1 p.m. Saturday in Immanuel United Methodist Church, 756 Main St., Cheswold, where friends may attend a viewing two hours prior. Interment will be in the church cemetery. Instead of flowers, the family suggests contributions to help defray funeral costs sent to Torbert Funeral Chapel, 61 S. Bradford St., Dover, DE 19904. Letters of condolence may be sent and guestbook signed at www.torbertfuneral.com. Jeannette R. Sammons, 80, of West Deptford, NJ, on November 24, 2002. Loving wife of the late Cecil Sammons. She is survived by two daughters Sherree A. Baker and her companion Ronald Tracy of Clarksboro, and Sheila L. (Charles) Sacco of Thorofare, her six loving grandchildren, Gregory Baker, Andrew Hartman, Samantha Hartman, Sabrina Sacco, Kayleigh, and Kyle Sacco; also her brothers Otis P. Smith of Gloucester, NJ, R. Robert Smith of Santa Cruz, CA, and sisters Grace Henefer of Ft. Myers, FL, and Shirley Lance of Buena Vista, NJ; also her former son-in-law George Baker. Mrs. Sammons has lived in West Deptford since 1953. She was from Gloucester City, and a Gloucester High School Graduate in 1941. She worked for 3 years at the Gloucester County Times in the mail room, until Oct. of 2002. She was an avid bowler, loved the casino's, her beloved Philadelphia Phillies, and spending time with her grandchildren. Services will be Wednesday November 27, at 2 PM at Davis Funeral Home, 171 Delaware St., Woodbury, NJ. A viewing will start at 12 noon on Wednesday. Interment in Woodbury Memorial Park. Contributions to the Animal Orphanage of Voorhees, Cooper Rd., Voorhees, NJ 08043. John L. Sammons Sr., age 73, of Bridgeton, died Tuesday, Feb. 18, 2003, in South Jersey Hospital System-Bridgeton Division, after a brief illness. Mr. Sammons was born in Bridgeton and was the son of the late Oscar and Lettie Sammons. The husband of the late Harriet Jones Sammons, he had lived at his present address for 10 years and prior to that had lived in the Millville area. Prior to his retirement he had been employed in the maintenance department at Wade East Apartments in Millville for 10 years. He was a member of the Nanticoke Lenni Lenape Indian Tribe and the American Legion. Mr. Sammons was a veteran of the U.S. Army, serving during the Korean Conflict. He was a Black Belt in Karate and enjoyed flea markets and fishing. 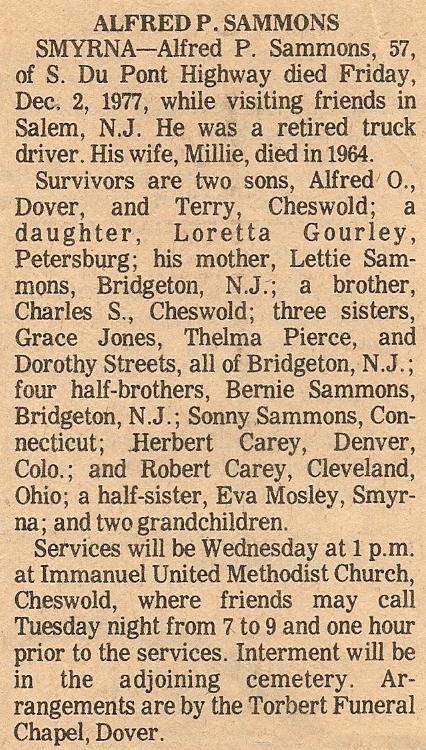 Survivors include; three sons, John Sammons, Bridgeton, Michael Sammons, Minatola and Curtis Sammons, Millville; one daughter Patricia Sammons, Pennsylvania; three sisters, Thelma Pierce, Bridgeton, Dorothy Sammons, Cedarville and Eva Mosley, Dover, DE, and several grandchildren, nieces and nephews. He was preceded in death by four brothers, Oscar Sammons, Charles Sammons, Alfred Sammons and Vernon Sammons and two sisters, Rebecca Sammons and Grace Jones. Funeral services will be held Saturday, Feb. 22, at 12:00 o'clock noon in the Padgett Funeral Home, 160 Main St., Cedarville. Burial will be in Cedar Hill Cemetery, Cedarville. Friends will be received Saturday morning one hour prior to the services at the funeral home. In lieu of flowers the family suggests donations to the Nanticoke Lenni Lenape Indians Building Fund, 18 East Commerce St., Bridgeton, N.J. 08302. John ''Jack'' R. Sammons, Jr. 72 of Willingboro, died Wednesday, September 19, 2001 in the Meadowview Care Center. Born in Fairton, he was a former resident of Bridgeton and moved to Willingboro in 1967. He was the son of the late John Sammons, Sr. and Mabel Carney. He was an avid bowler and lived life to the fullest. He was a member of the Senior Bowling League in Burlington. He leaves to cherish his memory his beloved and devoted wife of 48 years Terry, three devoted children, John Sammons of Deptford, Vicki Sammons of Fairfax, VA and Kathy Rucker of Delran, a daughter in law Stacey, three grandchildren Amber Speights, Michael Rucker and Kristen Speights, two sisters Dorothy Tudos and Agnes Greene both of Bridgeton, numerous nieces, nephews, other relatives and friends. A brother Edward predeceased him. Services will be held Saturday at 11am in the Trinity A.M.E. Church Gouldtown, with Pastor Alvin Stokes, officiating. Friends may call at the church after 10am. Interment will be at the convenience of the family. Arrangements Edwards and Son Funeral Home, Inc. Bridgeton and Salem. 1. Obituary: Kimberly "Kim" Yvonne Sammons of Dover went home to rest in the arms of Jesus Thursday, Feb. 28, 2002, in Bayhealth-Kent General Hospital, Dover. She was 41. Ms. Sammons was born Nov. 13, 1960, in Dover, she was born the oldest to Barbara Velez and the late Perry W. Sammons Jr. She also had a loving and devoted stepfather, Domingo "Poppy" Velez and a fiancé, Claude Hackett. She attended Dover schools and graduated from Dover High School in 1978. Her days were filled with caring for her two devoted children, working with plastic canvas, and spending time with all her family members. She kept in touch daily with all her friends and family by way of tele-phone and her conversations were ended with "Pray for me, and I love you." She loved watching reruns of Bonanza, dancing, and shopping with Claude and her children. She worked at WaWa up until her illness and was a faithful attendee of the Immanuel Union United Methodist Church. The many prayers and thoughts kept her going through her trying days. In addition to her father, she was preceded in death by a daughter, Cheyenne Marie; her grandfather, John Coker; her grandparents, Perry W. Sr. and Sarah Sammons, an aunt, Carolyn M. Carney, and an uncle, Donald Coker. She is survived by a son, Dustin Matthew at home; a daughter, Shiloh Yvonne at home; a grandmother; Lillian Coker; a brother and sister-in-law, Perry "Billy" and Julie Sammons of Dover; a niece, Brett Nicole of Dover, and a host of loving aunts, uncles, and cousins. Services will be private and at the convenience of the family. Arrangements by Torbert Funeral Chapel, Dover. 2. Cumberland County Reminder, Smoke Signals column, 15 March 2002. The Nanticoke Lenape Indian Tribe was saddened to hear that Kimberly (Kim) Sammons of Cheswold, Del., passed away, after a long illness, at Dover General Hospital on February 28, at the age of 42. Kimberly was the daughter of Barbara Coker Sammons Valez and the late Perry Sammons Sr. She is survived by two children, her mother and a brother, Perry (Billy) Sammons Jr.
Services and interment were held on Sunday, March 3 at the Immanuel Union United Methodist Church in Cheswold, Del. 1. Obituary: Letisha T. “Lettie” Sammons, 84, died suddenly Tuesday at Bridgeton Hospital. Born in Kent County, Del., she was the daughter of the late Charles and Emily Ridgway. She was the wife of the late Oscar P. Sammons and had been the companion of the late Odis W. Sammons for more than 40 years. Surviving are four daughters Grace E. Jones, Thelma M. Pierce, Dorothy V. Sammons and Eva M. Mosely; two sons, John L. Sammons and Vernon C. Sammons; 36 grandchildren; 55 great-grandchildren, a great-great-grandchild and several nieces, nephews and cousins. She was predeceased by three sons, Alfred P. Sammons, Oscar P. Sammons and Charles E. Sammons; a daughter, Rebecca E. Johnson; a brother, Alfred Ridgway, and two sisters, Mazzie Ridgway and Rebecca Turpin. Funeral services will be held at noon Saturday from the Lively Funeral Home, 656 E. Commerce St. Friends may call one hour prior to the services at the funeral home. Interment will be made in Greenwood Memorial Park, Millville. 2. Death Notice: SAMMONS — in Bridgeton Hospital of RD 7, Fairton-Gouldtown Roads Bridgeton, Tuesday, Dec. 3, 1985. Letisha “Lettie” Sammons, mother of John, Vernon, Grace Jones, Thelma Pierce, Dorothy Sammons and Eva Mosley, aged 84 years. Relatives and friends are invited to attend the funeral services without further notice from the Lively Funeral Home, 656 E. Commerce St., Bridgeton, on Saturday, Dec. 7 at 12 noon. Interment at Greenwood Memorial Park, Millville. Friends may call 11 a.m. to 12 noon at the funeral home. 3. Death Notice: Letisha T. Sammons of Bridgeton, N.J. died Tuesday, Dec. 3, 1985 in Bridgeton Hospital, Bridgeton, NJ. She was 84. Mrs. Sammons was born in Kent County, Delaware. She was a resident of Bridgeton, N.J. for more than 55 years. She was the wife of the late Oscar Sammons. She is survived by two sons, John Lewis Sammons of Millville, NJ., and Vernon Clarence Sammons of Seabrook, N.J; four daughters, Grace Jones, Thelma Pierce and Dorothy Sammons, all of Bridgeton, and Eva Mosley of Dover 53 grandchildren and -- great-grandchildren. Services at Lively Funeral Home, E. Commerce St., Bridgeton. Interment Greenwood Memorial Park, Millville, N.J.
Mrs. Ben Simons, 70, of 34426 Sims Street, died Wednesday forenoon of a heart attack, an ailment from which she had been suffering periodically for the past four years. The death was very sudden, said her husband, who explained that he had talked to her before he left the house early in the morning. When he came back in the middle of the afternoon she was dead. Mrs. Simons was born Lillian Norewood in Gloucester, N.J., on February 14, 1868. She came to Michigan when she was a child, with her parents. In the late fall of 1886, she married Mr. Simons who survives her and one son, Ben Jr. of Dundee, Mich. The youngest Mr. Simons is receiver for the banks in Dundee, Milen and Manchester. Funeral services will be held at the Uht Funeral Chapel at one o'clock tomorrow morning. Rev. Young will conduct the services and she will be buried in Glenwood Cemetery. Lorenzo Sammons of near Millsboro, died Tuesday, Feb. 27, 1979, at Beebe Hospital, Lewes, after a long illness. He was 81. Mr. Sammons was a retired farmer. He is survived by his wife, Ida Wright Sammons; a stepdaughter, Helen V. Johnson of Lewes; a brother, Frank of Bridgeton, N. J., a sister, Cora Draine of Chester, Pa., a step-grandchild, two step-great-grandchildren, and a step-great-great-grandchild. Funeral services win be Sunday at Christ Church near Harbeson. Burial will be in the church cemetery. Lydia Frances Sammons, age 92, of Hopewell Township, died early Sunday morning at the home of her grandson Nathaniel Pierce where she had been staying during a recent illness. She had been in declining health for three years. Born in Fairton, the daughter of the late John and Anna Pierce Coward she was the wife of the late William B. Sammons. She had been a Hopewell Township resident for 12 years and prior to that had resided in Greenwich. Mrs. Sammons was a homemaker and had been active throughout her life compassionately sharing her home and raising over 15 foster children as a foster parent for the State of New Jersey Child Welfare Agency-Division of Youth and Family Services for over 50 years. She had also assisted her late husband in the operation of the family farm on Stathem's Neck Road in Greenwich Township. She was a member of the Hopewell Church of God and was active in her church as a teacher, Ladies Auxiliary Worker and a participant in church dramas for many years. She touched so many lives by the way that she lived and served the Lord. She is survived by a daughter, Anna F. Pierce of Hopewell Township; two sisters, Alice Carney and Velma Coombs both of Hopewell Township; one brother, John Coward of Fairton; two grandsons, Nathaniel Pierce, Jr. and his wife Matilda of Hopewell Township and Dennis Pierce and his wife Ruth of Commercial Township. She was predeceased by two sisters, Grace Durham and Minnie Coombs and a brother Henry Coward. Funeral services will be held at the Padgett Funeral Home, 1107 Stat Highway # 77, Upper Deerfield Township on Friday at 10 am. Burial will be made at Gouldtown Cemetery in Fairfield Township. Friends may call on Thursday evening from 7-9 pm at the funeral home. 1. Obituary: Mabel C. Reed Sammons, 73, of 11 Wiley St. died Thursday afternoon in Bridgeton Hospital, where she was a patient for three weeks. She had been in failing health the past six years. Born in Cheswold, Del., she was the daughter of the late Walter and Rhoda Palmer Ridgway and the wife of W. Frank Sammons. She had resided at her present address three years and had formerly lived in Greenwich for 30 years. Mr. and Mrs. Sammons would have celebrated their first wedding anniversary this Sunday. Mrs. Sammons was a seamstress and had formerly been employed by the M.C. Schrank Co., Mark Manufacturing and most recently the Theber Dress Co., from which she retired 13 years ago. She was a member of St.. Andrew’s Episcopal Church. The deceased was formerly married to the late John A. Reed, who died in 1973, and from that marriage she is survived by two sons, Floyd of Elsinboro and Ronald Reed of Bridgeton, and two daughters, Thelma Coward of Cherry Hill and Betty Holman of Camden. She is also survived by three stepsons, Warren of Media, Pa., Jay of Camden and Michael Harmon of Broomall, Pa.; four stepdaughters, Gloria Harom and Shirley Carney, both of Yeadon, Pa., and Lorraine DeMaio and Lena Jackson, both of Philadelphia; a sister, Alberta Pritchett of Cheswold; 14 grandchildren and several great-grandchildren. She was predeceased by three sons, Homer, Donald and Walter Reed. The funeral will be held Monday at 9 a.m. from the Carll-Peterson-Ilacqua Funeral Home, 208 E. Commerce St., and will be followed by the Burial Office and Requiem Eucharist at St. Andrew’s Episcopal Church, 186 E. Commerce St., with Canon E. Thomas Higgons, rector, serving as celebrant. Interment will be made in East View Cemetery in Salem. Friends may call Sunday evening from 7 to 8:30 at the funeral home. For those who desire, the family suggests contributions in Mrs. Sammons’ memory be made to the American Heart Association, 32 E. High St., Glassboro, N.J. 08028. 2. Death Notice: SAMMONS -- Of 11 Wiley St., Bridgeton, N.J., on Thursday, March 22, 1984. Mabel C. Reed Sammons, wife of W. Frank Sammons, and mother of Floyd Reed, Ronald Reed, Thelma Coward, Belly Holman, aged 73 years. Relatives and friends are invited to attend the funeral without further notice from the Carll-Peterson-Ilacqua Funeral home, 208 E. Commerce St., on Monday morning at 9 am., followed by the reading of the Burial Office and Requiem Eucharist at St. Andrew’s Episcopal Church, 186 E. Commerce St. at 10 am. 3. In memory of: Mabel C. Sammons, who resided at 11 Wiley Street, Bridgeton, N.J. Date of Birth June 1, 1910, Date of Death March 22, 1984, Place and Time of Services: Monday, March 26, 1984 at 10 a.m., St Andrew's Episcopal Church, Bridgeton, N.J. Clergyman, Canon E. Thomas Higgons. Place of Interment: East View Cemetery, Salem, N.J.
4. Obituary: BRIDGETON, N.J. - Mabel C. Reed Sammons, of 11 Wiley St., Bridgeton, N.J., died Thursday, March 22, 1984, in Bridgeton Hospital after a long illness. She was 73. Mrs. Sammons was born in Cheswold, the daughter of the late Walter and Rhoda Palmer Ridgeway. She was a patient at the hospital for three weeks with failing health for six years. She resided at her present address for three years and formerly lived In Greenwich Township, N.J.
She was a seamstress formerly employed by Dark Manufacturing and most recently by Teberress Co., retiring 13 years ago. She was a member of St. Andrew's Episcopal Church. She was formerly married to the late John A. Reed, who died in 1973. Three of her sons, Homer, Donald and Walter Reed, are deceased. She is survived by her husband, W. Frank Sammons; two sons, Floyd Reed, Elsinboro, N.J., and Ronald Reed, Bridgeton, N.J.; two daughters, Thelma Coward, Cherry Hill, N.J., and Betty Holman, Camden, N.J.; three stepsons, Warren Harmon, Media, Pa., Jay Harmon, Camden, N.J., and Michael Harmon, Broomall, Pa.; four stepdaughters Gloria Harmon and Shirley Carney, both of Yedon, Pa., and Lorraine DeMaio and Lena Jackson, both of Philadelphia; a sister, Alberta Pritchett, Cheswold; 14 grandchildren; and several great-grandchildren. Services will be 9 am. Monday at the Carl-Peterson-Ilacqua Funeral Home, 208 E. Commerce St., Bridgeton, N.J., followed by burial and a requiem eucharist at St. Andrew's Episcopal Church, 186 E. Commerce St., Bridgeton, with Canon E. Thomas Higgins, Rector, serving as celebrant. Friends may call at the funeral home Sunday from 7 to 8:30 p.m. Burial will be In East View Cemetery, Salem, N.J. The family suggests contributions in Mrs. Sammons' memory to the American Heart Association, 32 E. High St., Glassboro, N.J. 08028. Margaret E. Sammons Of Gilpin Hall, formerly of New Castle, died at Wilmington Hospital on Tuesday, January 18. Mrs. Sammons was a homemaker and a member of Holy Spirit Catholic Church and St. Peter's Adult Center. She was an avid bingo player. Her husband, Forrest G. "Frank" Sammons, died in 1970. 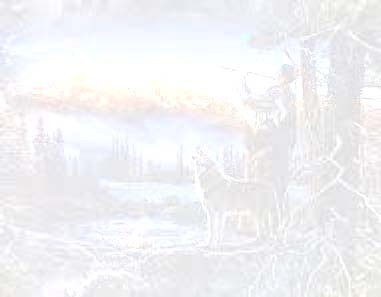 She is also predeceased by her sons, Roger, Forrest and William, and a grandson, Gerald. She is survived by a son and daughter-in-law, Francis "Mike" and Nancy Sammons, and daughter and son-in-law, Patricia and John Drzewicki, all of Wilmington; a daughter-in-law, Theresa Sammons of New Castle; 16 grandchildren, 30 great-grandchildren, and 2 great great grandchildren. Mass of Christian Burial will be held on Saturday, January 22 at 10:30 a.m. at Holy Spirit Church, 12 Winder Road, Garfield Park, New Castle. Friends are invited to attend calling hours on Friday evening from 6 p.m. to 8 p.m. at MEALEY FUNERAL HOME, Limestone and Milltown Rds., Wilmington. Interment will be at All Saints Cemetery, Wilmington. In lieu of flowers, the family suggests donations to St. Peter's Adult Center, 6th and Tatnall St., Wilmington, DE 19801 or Gilpin Hall, 1101 Gilpin Ave., Wilmington, DE 19806. Mary Lou Dean Sammons, age 86, of Fairfield Township, passed suddenly and unexpectedly October 27, 2013 in Inspira Health Center, Bridgeton. Born in Bridgeton July 2, 1927, she was the daughter of the late Robert and Amelia (Greenage) Dean, and was raised in her younger age by the late William and Francis (Coward) Sammons. She was the wife of the late Arthur A. Sammons. Mary Lou grew up in the Greenwich area and had been an area resident all of her life. She was formerly employed for many years with M.C. Schrank Company in Bridgeton, and had formerly worked for Major Clothing Co., and Theiber Dress Co., and lastly the former Manheim Nursing Center in Bridgeton from which she retired in Housekeeping. She was a member of Haven United Methodist Church in Quinton. Mary Lou enjoyed shopping and spending time with her godchildren. She also enjoyed bus trips and outings and talking on the phone with her friends. Her constant companion was her daughter Deanie. She is survived by her daughter, Helen "Deanie" Dean of Fairfield Township; her godchildren, Alesha Wearing and Anthony, and Alaysia Wearing, her aunt, Alice Carney of Hopewell Twp. and a host of nieces, nephews and various other relatives. She was predeceased besides her parents and husband by her two sisters, Estella Coombs, and Rebecca Pierce, and several foster brothers and sisters. Mary Louise Sammons of Kenton died Friday, July 31, 1998, in her home. She was 86. Mrs. Sammons was born in Kenton, the daughter of the late Clinton Watson and the late Bessie Watson. She was educated in the Kenton Public School System. She was employed for many years by the Wheatley Factory, and retired from the Campbell Soup Company. Mrs. Sammons was a former member of Blanco A.M.E. Church in Clayton and an active member for 61 years of Byrd's A.M.E. Church in Clayton, where she served as president of the Senior Choir, a member of the Steward Board, president of both the Steward Board and the Usher Board, Superintendent of the Sunday School, and President of the Bertha Dickerson Women's Missionary Society for 20 years. She was preceded in death by her husband, Gilbert C. Sammons, in 1957. She is survived by five daughters, Margaret Burton of Atlantic City, N.J., Ernestine J. Holden of Dover, Marion Teresa Johnson of Salem, N.J., Gloria Harrison of Clayton and Clynthia N. Flanigan of Clayton; a daughter-in-law, Elizabeth Sammons of Wilmington; two sons-in-law, Rev. Horace E. Burton Sr. of Atlantic City, N.J., and Edward Harrison of Clayton; a sister, Catherine Watson Mears of Inkster, Mich.; three brothers, Allie Watson of Wilmington, George Watson of Smyrna, and Rev. Robert Watson of Clayton; five sisters-in-law, Isabell Watson of Wilmington, Ethel Watson of Smyrna, Grace Watson of Clayton, Vanilla Watson of Wilmington, and Gertrude Watson of Wilmington; a brother-in-law, Henry Mears of Inkster, Mich.; 23 grandchildren, Cynthia Burton Graham, H. Edward Burton Esq., Tracee Burton McSwain Esq., Zina Burton Thompkins, Beverly Holden Weathersby, Jacqueline Holden Dixon, William L. Holden III, Judith Ann Holden Nixon, Stephanie Holden Boyd, Linda Holden Senor, Anthony Johnson, Aaron Michael Johnson, Edward Harrison Jr., Ricky Harrison, Larry Harrison, Bruce Harrison, Gary Harrison, Louis A. Flanigan, Jondella Flanigan, Homer Sammons, Jacqueline Smith, Owen Sammons, and Bernard Sammons; 55 great-grandchildren; 31 great-great-grandchildren and a host of nephews, nieces, and cousins. Service will be 1 p.m. Thursday at the Mt. Zion A.M.E. Church in Dover, where friends may call two hours prior to service. Burial will be in Massey Cemetery, Green Springs. Arrangements by Minus Funeral Home, Dover. Church program: Cheswold, DE February 11, 1998 Matthew Matty Wade Sammons, Jr., son of Matthew Sammons and Suzette Coker was born March 16, 1987 in Dover, Delaware. He entered Into this earths resting place on February 7, 1998, at the age of 10, where he will wait for the Lord Jesus Christ to return. He was enrolled In the Smyrna School District as a home bound student In the 5th grade. His he, though somewhat physically limited due to Muscular Dystrophy, was lived to the fullest. He loved to play video games and enjoyed all the toys he had. He also loved to go to the mall where he would spend time in the toy store. When asked what he wanted, Matty would always tell everyone to get him toys. I dont want clothes, he would say, Just get me some toys. Every time he would receive a greeting card in the mall he would look to see if there was a dollar in it. He enjoyed going outside to play and look for his best friends. He would sit on the porch and call Ashley, Kevin and R.J. Attix to come over and play. He was truly a gift from God. He loved everyone he came in contact with and made it a point to spread his love to anybody who knew him. He truly loved having his family and friends at home with him. Matty was also very fond of his home nursing staff at A. I. DuPont Institute. He leaves to mourn his death: his parents. Matthew and Andrea Sammons, Suzette and Justice Steele. One sister, Michelle Nichole Sammons. Two step-brothers, Michael and Steven Usilton, and step-sister in-law, Pamela Usilton. His grandparents, Janet & Richard Scotton, Ulysses Emery & Carol Sammons, Marion D. Carter, James H. Carter, who preceded him in death. Sharon and Sam Ratray. Grace and Earl Usilton and His great grandparents, Ulysses Grant and Delores Sammons. Betty Johnson. His special friends were his uncle Hoss, his nephew Josh Usilton. His special playmates, Ashely, Kevin and R.J. Attix and a host of uncles, aunts, cousins, family and friends. Wednesday, February 11, 1998 2:00 p.m. Forest Grove Seventh-day Adventist Church, Interment - Forest Grove Cemetery. Vladimir Corea, Pastor. Arrangements by Matthews-Bryson Funeral Home, Smyrna, DE. Mildred Helen ''Millie'' Sammons of Dover died Monday, Sept. 13, 1999, in Kent General Hospital, Dover. She was 53. Mrs. Sammons was born on Sept. 23, 1945, the daughter of Franklin and Mildred Collins Foraker. She worked as a nursing attendant at the Delaware Home for the Chronically Ill, Smyrna, retiring in 1991. Mrs. Sammons loved to collect angels. She is survived by her husband, Glendon M. Sammons Sr. of Dover; two sons, Glendon Sammons Jr. and William Sammons, both of Dover; two daughters, Mazie Krammer and her husband, Todd, of Magnolia, and Sarah Sammons of Dover; two grandsons, Jason Foraker and Will Krammer, both of Magnolia; and three granddaughters, Kaylinn Rodriquez of Marydel, Md., Paige Kramer and Mandy Kramer, both of Dover. Service will be 11 a.m. Saturday at Immanuel United Union Methodist Church, Cheswold, where friends may call one hour prior to service. Burial will be in the church cemetery. Instead of flowers, family suggests contributions to: American Heart Association, 625 South State St., Dover, DE 19901. Muhammad I. "Billy" Sammons, 84, of Houston, TX and formerly of Mizpah died Friday, May 2, 2014 at home. Born in Cheswold, DE on May 19, 1929 he was the son of the late Preston L. Sammons, Sr. and Nellie Carney Sammons. He had been a Houston resident for the past 18 months and prior to that had resided in Mizpah and New York City. Prior to his retirement, Mr. Sammons had been employed as an Assistant Director in the Communications Department of British Airways in New York City for 30 years. He enjoyed music, art, theater, travel and the language arts. Surviving are his two sisters, Della Lockman of Reynoldsburg, OH and Joann Boulay of Spencer MA; his two brothers, Benjamin Morgan of Houston, TX and Gerald Morgan of Baltimore, MD; two aunts, Sadie Seeney and Alice Carney both of Bridgeton and many cousins, nieces, nephews and other relatives. He was predeceased by three sisters, Betty L. White, Irene Ridgeway and Mary Jane Harris and a brother, Preston L. Sammons, Jr. Sorry to report the passing of Norman Simons, Chatham, Ontario, Canada. He was the great-great grandson of Benjamin Sammons, Sr. and Sarah Miller of Delaware, USA. He was the great-grandson of Benjamin Sammons, Jr., of Delaware and Sarah Richardson of Kentucky who met and married in Dover Twp. East, Kent County, Ontario. 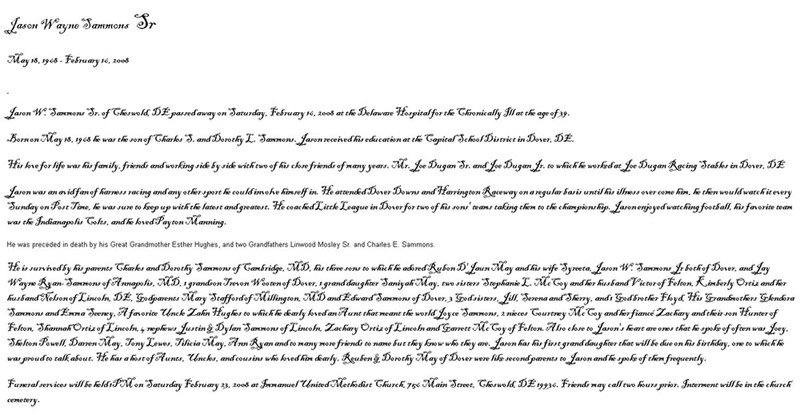 Benjamin Sammons, Jr.'s sister, Mary Sammons of Delaware, met and married James Richardson of Kentucky, in Dover Twp. East, Kent County, Ontario. Another sister of Benjamin Sammons, Jr., Sarah Sammons, married Peregrine (Perry) Handsor, Jr., both of Delaware, who later brought their family to Dover Twp. East, Kent County, Ontario. His daughter, Norma Jean Lloyd <nlloyd@umich.edu>, informed us of his passing. Excerpts from the Obituary of Norman Simons, Chatham, Ontario, deceased September 22, 2002. Norman Simons was born at home on December 12, 1927 in Sheldon, Michigan. He was the fifth child of William Simons who was born in Dover Township, Kent County, Ontario and Clara Evans who was born in Whittaker, Michigan. His paternal grandparents were William Henry (Salmons) Simons who was born in Dover Centre, Kent County, Ontario and Lucinda Etta Hutchinson who was born in Kent County, Ontario. His maternal grandparents were George Henry Evans and Hannah Delitha McCurdy of Colchester Township, Ontario. Norman had three brothers, William McCurdy Simons, Therlow Benjamin Simons, and George Henry Simons. His sisters were Dorothy Irene Fields and Arletta Marie Williams. Only Therlow survives. On June 9, 1956 Norman married Beatrice Ivy Timbers at First Baptist Church, Windsor, Ontario. They resided in Chatham, Ontario. To this union they were blessed with 3 children: Joann, Norma Jean, and Daniel. He became a widower. On March 9, 1996, he married Emma Jean (Kersey) Rolls at First Baptist Church in Chatham, Ontario. Norman was proud to be a member of St. John’s Lodge #9 for 42 years. He served in several offices during his tenure including Worshipful Master. Norman leaves to cherish wonderful memories, a wife Emma Jean, his two loving daughters Joann, Norma Jean and husband Wayne Lloyd, one son Daniel and two grandchildren, Victoria and Christopher Lloyd, one brother Therlow, nieces, nephews and a host of friends. Services will be held at the Union Baptist Church, 10585 Union Line Road, Dresden, Ontario, Thursday, September 26, 2002 at 11:00 a.m., and his interment will be at The Dresden, Ontario Cemetery, immediately afterwards. Odis W. Sammons, 70, of Burlington Rd. died Tuesday in Bridgeton Hospital. Born in Cheswold, Del., he had been an area resident for several years. He is survived by his wife, Lettie T. Sammons; two daughters, Shirley A. Townsend and Janet M. Street; three brothers, Elmer, Stanley and Morris Sammons; five sisters, Hazel Coker, Annabel Carney, Mary V. Reed, Beatrice Carney and Creany Christinson; three grandchildren and two great-granddaughters. Services will be held Saturday at 2 p.m. from the Lively Funeral Home, E. Commerce St.. Interment will be made in Greenwood Memorial Park, Millville Friends may call Friday evening from 7 to 9 at the funeral home. In Memorium: In memory of Oscar P. Sammons who passed away October 29, 1961. Sadly missed, Wife Grace and sons, Alfred, Charles and Robert. 1. Obituary: Perry W. Sammons, Sr., 60, of Dover, Del., died Sunday at Kent General Hospital, Dover, Del. he was stricken at home and pronounced dead on arrival at the hospital. A native of Kent County, Dover, he was active in the county Republican party for many years. he was a member of Immanuel United Methodist Church, Cheswold, Del. Survivors include: his wife, Mrs. Sarah Eunice Sammons; two sons, Perry W. Sammons, Jr. and Glendon Sammons, both of Dover; three daughters Mrs. Carolyn Carney, Mrs. Betty M. Seeney, both of Dover, and Miss Carmella Sammons, at home; six grandchildren; a brother, Ulysses Sammons, Dover, two sisters, Mrs. Edith Morris and Mrs. Bertha Mosley, Dover and several nieces and nephews in Bridgeton. Funeral services will be held Thursday at 1 p.m. at the Immanuel United Methodist Church. Interment will be in the church cemetery. Friends may call Wednesday from 7 to 9 pm and Thursday from noon to 1pm. Funeral arrangements are being made by the Durham Funeral Home, Dover, Del. 2. Death Notice: SAMMONS — Of Dover, Del. on Sunday, May 20, 1973. . Perry W. Sr., husband of Sara Unice Sammons, aged (60?--hard to read) years. Relatives and friends are invited to attend the funeral services without further notice from Immanuel United Methodist Church, Cheswold, Del. on Thursday at 1 p.m. Interment at church cemetery. Friends may call Wednesday 7 to 9 p.m. and Thursday noon to 1. Arrangements under the direction of Donald Durham, funeral director. SEAFORD - Roland Joseph Sammons of Seaford died of renal failure Monday, May 20, 2002, in Nanticoke Memorial Hospital, Seaford. He was 90. Mr. Sammons was born near Georgetown, son of the late Willard Passwaters Sammons and Sadie Givens Sammons Bailey. He was a World War II veteran. He was employed by the state of Delaware as a new construction supervising inspector, overseeing hundreds of miles of state secondare and primary road construction in Sussex County. His last project was supervising the inspection and addition of the new southbound bridge at the Indian River Inlet south of Dewey Beach. He retired from DelDOT in 1976. Prior to World War II he was a barber in Seaford and Blades. Once DuPont began in Seaford he was employed as an operator and later as a member of the guard force during the war. Mr. Sammons attended Epworth Fellowship Church, Laurel. In addition to his parents, he was preceded in death by his wife of 64 years, Erma Marine Sammons, in 1998. He is survived by a son, Wayne M. Sammons of Rehoboth Beach; two granddaughters, Glee M. Corona of Delmar, Md., and Michele W. Lloyd of Wilmington; and three great-grandchildren. Services will be 1 p.m. Friday at Epworth Fellowship Church, Sycamore Road Laurel, where friends may call one hour earlier. Pastor Ronald J. Smith will officiate. Burial will be in Blades Cemetery. Instead of flowers, contributions may be made to Epworth Fellowship Church or Epworth Christian School, 14545 Sycamore Road, Laurel, DE 19956. Arrangements by Watson Yates Funeral Home. She was a member of St. John United Methodist Church, and belonged to the United Methodist Women. Also a member of the American Association of Retired persons. She loved her church and served it well. Her membership was one of great delight, with her smiling face she enjoyed the many messages that were spoken and laid upon her heart and mind. She made them useful during the good time and bad with her family and friends. She loved the hymns of the church. She will be missed by her many friends. One of her favorite phrases from the bible was the 139th Psalm. Besides her husband, she leaves to mourn seven children, Gloria E. Harmon, Lorraine M. DiMaio, Warren B. Harmon, Lena M. Jackson, Shirley A. Carney, Michael S. Harmon, all of Philadelphia, and Jay A. Harmon of Bridgeton, also 22 grandchildren, 2 great-grandchildren, and a host of relatives and friends. Services on July 6, 1975. Pallbearers: Warren Harmon, Michael S. Harmon, Jay A. Harmon, John Carney, Jr., Richard DiMaio, Richard Jackson. Honorary pallbearers: William Carney, Roland Carney. Funeral arrangements by the Lively Funeral Homes, Inc. Interment, Fernwood Memorial Park on Monday July 7, 1975. Sarah Eunice Sammons of Dover went home to the arms of Jesus on Sept. 17, 2001, with her loving family by her bedside holding her hands. She was 84. Eunice was born May 20, 1917, in Kent County, daughter of the late Mike Ridgway and Mae Carter Ridgway. She attended Kenton School and was a lifetime resident of the area. Eunice spent her days attending to her children along with being a mother and grandmother to many whose parents had to work or if a child was sick. Her house was always the place to be. She enjoyed many hours of watching her finch, "Bird," and also watching the many beautiful birds of the wild. She was an avid fan of the Philadelphia Phillies, and in May of 1993 for her birthday, she received from the team, a jacket and hat that she wore with great pride. Eunice was a lifetime member of the Immanuel Union United Methodist Church in Cheswold. In addition to her parents, she was preceded in death by her husband, Perry William "Bill" Sammons Sr., in 1973; a son, Perry Jr.; a daughter, Carolyn M. Carney; a loving stepmother, Caroline Ridgway; four brothers, Pressley "Babe", Lawrence "Sonny", Floyd "Perk", and William "Buck" Ridgway; a son-in-law, James "Buck" Carney; a daughter-in-law, Mildred Sammons; and sister-in-law, with whom she raised, Bertha Mosley. She is survived by a son, Glendon M. Sammons of Dover; two daughters and son-in-laws, Betty M. and Joe Seeney of Dover, and Carmella and Wayne Stanton of Clayton; 13 grandchildren; six great-grandchildren; a brother-in-law, Ulysses "Buck" Sammons and his wife Delores; a sister, Verna Durham; a brother, Francis "Fin" Ridgway and his wife Edith; and many loving nieces, nephews and friends. Ulysses Emery Sammons Jr. of Cheswold died of respiratory failure Thursday, May 25, 1995. We was 33. Mr. Sammons was born in Dover to the late Ulysses Emery Sr. and Janet O. Carney Scotton. He was graduated from Dover High School in 1980. Mr. Sammons had worked as a painter for his grandfather and also worked for several restaurants in the Dover area. In 1984 he moved to the Baltimore area where he worked making neon signs. In 1989 he moved to California where he worked for Tar~ department store until he became ill. He loved to travel and go to the beach. He enjoyed hearing from family and friends and sending cards back home. Mr. Sammons dearly loved his niece, Michelle N. Sammons which he called his "sweetheart." He affectionately called his nephew, Matty Wade Sammons Jr., "little buddy," and also enjoyed sending them gifts and money in the mail. He was a member of the Forest Grove Seventh Day Adventist Church, near Cheswold. As a young boy, he was a member of the Pathfinders, a church-related organization for boys. He is survived by his father and stepmother, Ulysses Emery Sammons Sr. and Carol Sammons of Dover; his mother and stepfather, Janet D. Scotton and Richard Scotton of Cheswold; a brother and sister-in-law, Matthew and Andrea Sammons of Cheswold; his grandparents, Ulysses G. and Delores Sammons of Cheswold; a nephew, Matthew Wade Sammons Jr., of Cheswold; a niece, Michelle N. Sammons of Cheswold; a special aunt, Tammy Prelog of Avon Park, Fla.; and many aunts, uncles, cousins, and friends. Service will be 7 p.m. Saturday in Forest Grove Seventh Day Adventist Church, Pearson's Corner Rd. near Cheswold where friends may call one hour prior to service. Grove Seventh Day Adventist Church, care of Pastor Douglas Rennewanz, 4580 Halltown Road, Hartly, DE 19953. Arrangements by Mathews Bryson Funeral Home, Smyrna. Willard Glendon Sammons, 74 of North Carolina, died Sunday at New Hanover Regional Medical Center. He was born in Gibbstown. Mr. Sammons retired from DuPont after 40 years of service. He was a lifetime member of the Wilmington Bowling Association and was active in Little League in Wilmington. Surviving are his wife, Marjorie Lucas Sammons at home; one son, Norm Sammons of North Carolina; one daughter, Debra Sammons of Wilmington, NC; two brothers, Armwell Sammons of Mantua, and Gordon Sammons of Sparta, Tenn.; and two grandchildren. There are no services planned at this time. Contributions may be made to the American Heart Association, Memorial Processing Center, PO Box 5216, Glenn Allen, Va., 23058. William Simons of 4506 Artley in Bellesville, living here his lifetime, came from Canada, died unexpected on Dec. 31, at home at the age of 76. He was proprietor of a local gas station & garage. He was the husband of the late Clara Evans Simons and leaves children, Therlow of Chicago, Mrs. Dorothy Fields of Sheldon, George of Sheldon, Norman of Chatham, Ontario and Mrs. Arletta Williams of Ann Arbor, 19 grandchildren and was the brother of the late James Simons of Sheldon (1962). Services were held at the Sheldon Methodist Church on Wed. Jan. 4, with interment at Sheldon Cemetery in Sheldon. 1. Obituary: William B. (Tippy) Sammons, 82, Of RD 2, Stathems Neck Road died Tuesday at his home following a brief illness. He was born March 10, 1902, in Hopewell Township, Cumberland County. He lived most of his life in Greenwich Township. He was a farmer most of his life. His younger days he worked at Owens Illinois. The deceased was a member of St. John United Methodist Church, Fordville Road, Fordville, New Jersey. Mr. Sammons is survived by his wife, Frances Coward Sammons; a daughter, Anna Pierce of Bridgeton; a sister, Mary Corney of Bridgeton; two grandsons, Nathaniel, Jr. and Dennis Pierce. He was a father to five foster sons, Walter Carney of Bridgeton, Gregory Shaw of Boston, Mass., Charles Dawson of Millville, the late Albert Taylor of Lewiston, Maine, and James Randazzo, at home and the late John (Jack) Carney; five foster daughters, Estelle Coombs, Rebecca Pierce and Mary Sammons. all of Bridgeton, Bobbi Ann Jacobs and Helen Dean, both at home; 29 foster grandchildren and several nieces and nephews. He was predeceased by two foster sons, John (Jack) Carney and Alan Taylor. Services will be held Sunday, January 6, at St. John United Methodist Church, Fordville Road. Interment will be made in Gouldtown Memorial Park. Friends may call one hour prior to the services at the church. Arrangements are under the direction of the Lively Funeral Home, 656 E. Commerce St.
2. 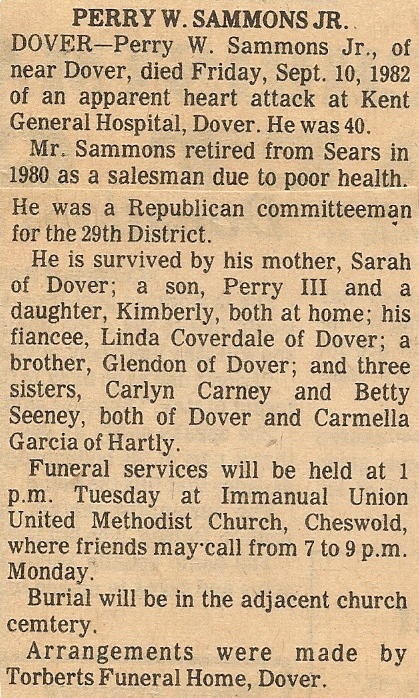 Death Notice: SAMMONS — Of RD 2 Stathems Neck Road, Bridgeton, N.J., on Jan. 1, 1985. William B. “Tippy” Sammons, husband of Frances Sammons, father of Anna Pierce, Walter Carney, Gregory Shaw, Charles Dawson, Albert Taylor, James Randazzo, Estelle Coombs, Rebecca Pierce, Mary Sammons, Bobbi Ann Jacobs and Helen Dean, aged 82 years. Relatives and friends are invited to attend the funeral services without further notice from St. John’s United Methodist Church, Fordville Road, on Sunday at 2 p.m. Interment at Gouldtown Memorial Park. Friends may call one hour prior to the services at the church. Arrangements by the Lively Funeral Home. 1. William Frank Sammons, formerly of Wiley Street, Bridgeton, died suddenly Sunday, March 24, 1991, in South Jersey Hospital System, Bridgeton Division. He was 82. Mr. Sammons had been ill for four years. He was a resident of Bridgeton Nursing Center for the past 2/2 years. A native of Cheswold, Del., he was the son of the late Isaac and Agnes Clark Sammons. He had been a resident of Philadelphia for many years and moved to Bridgeton when he retired in 1974. He worked as a truck driver at Miller Trucking Company, Philadelphia, for 10 years. He also was a chef at the Conestoga Inn and Restaurant in Wayne, Pa. A U.S. Army veteran of World War II, he was a member of the Assembly of God and the Nanticoke Lenni Lenape Indian Tribe in Bridgeton. He was preceded in death by his first wife, Sarah Mosley Harmon Sammons; four sisters, Millie Durham, Edna Mosley. Cora Draine and Laurel Sammons; and five brothers, Mitchell Sammons, Lorenzo Sammons, John Sammons, Preston Sammons and Mifflin Sammons. His second wife, Mabel Ridgway Reed Sammons, died in l984. He is survived by three stepdaughters, Gloria Harmon and Shirley Carney, both of Yeadon, Pa., and Lena Jackson of Philadelphia; three stepsons, Warren "Nip" Harmon of Alloway, Michael Harmon of Broomall, Pa., and Jay Harmon of Atco; and many grandchildren and great-grandchildren. Services will be at noon Thursday in Carll-Peterson-Ilacqua Funeral Home, 208 E. Commerce St., Bridgeton. Rev. Franklin Santley will officiate. Friends may call at the funeral home one hour before services. Burial will be in Fernwood Memorial Park. The family suggests contributions to the American Cancer Society, Orchard Road and Landis Avenue, Vineland, N.J. 08360 or to the American Heart Association, 2550 Route 1, North Brunswick, N.J. 08902. 2. SAMMONS — Formerly of 11 Wiley Street, Bridgeton, N.J., suddenly on Sunday, March 24, 199l, William Frank Sammons, husband of the late Sarah (nee Mosley) Harmon Sammons and Mabel (nee Ridgway) Reed Sammons, stepfather of Shirley Carney, Lena Jackson and Gloria, Warren “Nip,” Michael and Jay Harmon, aged 82 years. Relatives and friends are invited to attend the funeral services without further notice from the Carll-Peterson-IIacqua Funeral Home, 208 E. Commerce St., Bridgeton, on Thursday, March 28th at 12 noon. The interment will be made in the Fernwood Memorial Park. Friends will be received Thursday morning from 11 to 12 prior to the services in the funeral home. For those who desire, the family suggests that memorial contributions be made to the American Heart Assn., 2550 Route 1, N. Brunswick, NJ 08902. SAMMONS - In Bridgeton, N.J., on March 20, 1936, William Sammons, aged 67 years. Relatives and friends are invited to the services from the residence of his son, William B. Sammons, Greenwich Township, on Tuesday afternoon, March 24, at 2 o'clock. Interment in Gouldtown Cemetery. Friends may call Monday evening from 7 to 9 p.m.